LOOKING FOR A SPACE for your event, meeting, wedding, or memorial? Edwards Church welcomes you to our beautiful, handicapped-accessible building in the heart of Northampton. CHECK OUT our available rooms, and contact the church office for more information. 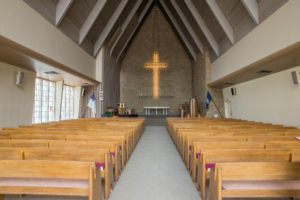 Our unique sanctuary, with its ­­45 ft. ceiling and excellent acoustics, is a favorite location for concerts, lectures, weddings, and memorials. Inspired by Frank Lloyd Wright’s designs, the southern “wall” is constructed entirely of glass. On a clear day, the sanctuary is flooded with light. At night, passers-by on Main Street enjoy a view of our 18-foot-high, hand-wrought iron cross from Sweden, lit from within by small lights. Seating capacity: approximately 240. 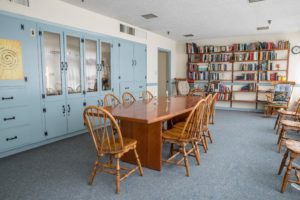 Your typical church fellowship hall, Addis Hall is an open space with chairs and folding tables available for meetings and receptions. Kitchen is across the hall. Seating capacity: approx. 100 at tables. 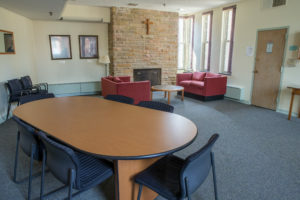 A popular space for workshops, meetings, and small-group gatherings, the Edwards Room features a large conference table, arm chairs, and a kitchenette. Enjoy a view of the courtyard through full-length windows, or draw the curtains for privacy and video projection. A second space for small group meetings, the Heritage Room seats up to 10 people around a conference table, with additional chairs available. Full-length windows provide a view of the courtyard. 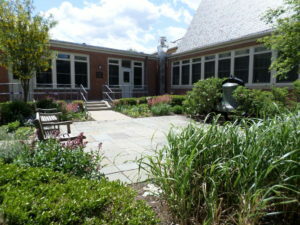 In fair weather, the courtyard is available for small group gatherings and receptions. The courtyard garden holds the 1892 steeple bell, and a unique, bowl shaped fountain of Vermont glacial stone.